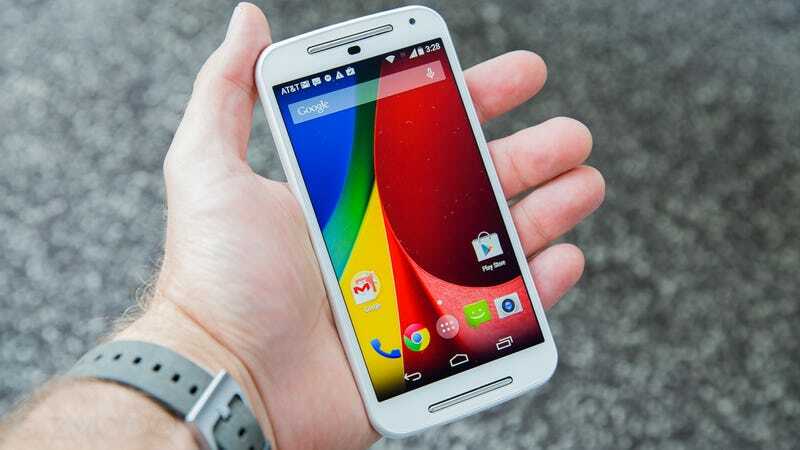 The new Moto G still has a 720p screen, but it's been bumped up to a full five inches (last year's was 4.5). The screen is actually very bright and colors really pop. At first glance you'd probably think it's 1080p. For the added screen real estate the device has gotten taller and wider, but it's actually just a hair thinner. Every part of the phone (inside and out) is nano-coated with a fluorinated hydrocarbon which makes it splash-proof. That's especially great to see on a phone like this—a lot of the people who are in the market for a low-cost phone can't afford to replace it if it dies. Up front, there are now dual, front-facing speakers, just like the new Moto X has. They're definitely not the exact same speakers, as the Moto X is louder and clearer, but still this is a massive improvement over last year's Moto G. Music sounds really pretty good, and gaming is much more immersive. The camera looks much-improved, too, which was definitely one of the weakest parts of the first generation. It's now an 8MP rear camera (up from 5MP) and it even has an f/2.0 lens, which should let more light in. The front-facing camera has been upgraded to 2MP from 1.3, too. The guts are generally unchanged. It's the same quad-core Qualcomm Snapdragon 400 processor clocked to 1.2GHz, but here's the amazing thing: It doesn't really seem to matter. The system runs incredibly fast and smooth. There was hardly any lag anywhere. Yeah, if want to start playing the latest and greatest HD games, it might not load as fast or be quite as buttery smooth, but again, this thing is $180, period. It might be a cheap phone, but it doesn't really move like one. The one major internal improvement is that the new Moto G has an SD card slot, and that's a very big deal for a lot of people. Hell, even the new Moto X doesn't have an SD card slot, which is sure to ruffle some feathers (though the X has more built in memory). Another big, big notch on the Moto G's belt is that it runs pure, unadulterated Android. Moto's customizations come in the form of apps which can all be updated independently of the OS, and that means updates will come with more speed than cheap Android phones that have a skin. It will launch with Android 4.4 (KitKat) and it's guaranteed an upgrade at least to the "L" version of Android. Spectacular. Every Moto G comes with a plain black back (though my review unit is white for some reason), but if you want to spend a few extra bucks, you can buy a colorful back plate and swap it out yourself (it'll take you 20 seconds). These typically range in price from $15 for a back, to $30 for a back with a flip cover, and they come in a ton of different colors. While using it I did feel like the back cover didn't affix quite as tight as I would like. It's not that I thought it would come off, it's just that it moves and creaks a little. It's one of the few things that makes the phone feel cheaper. The Moto G will be available in both single-SIM and dual-SIM variations, in 8GB and 16GB sizes, and it will be available today at noon eastern time from Motorola.com. Again, it costs $180, unlocked, with no carrier contracts. It's a real sweet deal. We'll be spending more time with it in the weeks to come and will have a full review for you soon.